ecoReserve’s first reserve is located in the Mamoni Valley in Panama and is part of the Mesoamerica Biodiversity Hotspot. Will Cadell, our geospatial engineer, provided a map that shows the location of the Mesoamerica Biodiversity Hotspot and the location of the Mamoni Valley in the hotspot (the red lines delimit outer boundaries of the Mamoni Valley). The term biodiversity hotspot refers to 34 biologically rich areas around the world that have lost at least 70 percent of their original habitat. The remaining land in these hotspots amounts to just 1.4 percent of the land surface of the planet, yet these hotspots support almost 60 percent of the world’s plant, bird, mammal, reptile, and amphibian species. The Mesoamerican forests are the third largest among the world’s hotspots. As we discussed in an earlier post, the Mesoamerica Biodiversity Hotspot spans most of Central America, encompassing all subtropical and tropical ecosystems from central Mexico to the Panama Canal and includes the Mamoni Valley. The Mesoamerica Biodiversity Hotspot is very important for biodiversity as it represents the place where the animals and plants from two regions come together (the Nearctic of North America and the Neotropical of South and Central America). About 3 million years ago, sections of Central America rose above sea level and formed a land bridge between the north and the south. After that occurred, species began to flow in both directions between the continents, and this helped to facilitate Mesoamerica’s unique and diverse variety of animals and plants. 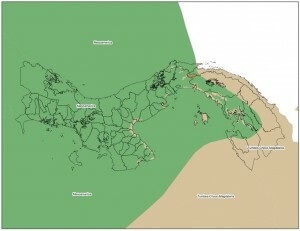 Because the mountains that exist in this hotspot are a barrier, there are many differences in both the animals and the plants between the Pacific and Caribbean coasts. However, the valleys and lowlands running parallel to the mountains are natural corridors for animal and human migrations and help facilitate the unique and diverse variety of plants. The Mamoni Valley is an important natural corridor for these animal migrations. 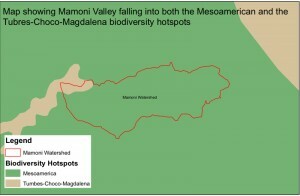 This map provides more detail of the area and the Mamoni Valley, the location of ecoReserve’s first reserve. Our junior researcher reports that they were named for their coat texture and that these guys live in cotton plants, have hooks for claws, and have prehensile tails. Their diet consists of ants, termites, bees, and ladybugs. (They’re immune to the poison.) 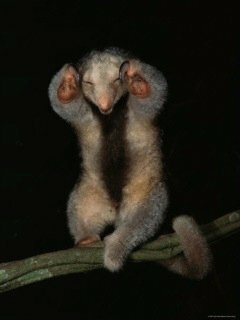 The silky anteater is only one of the species that lives in the Mesoamerica Biodiversity Hotspot and the Mamoni Valley. There are many more species that are native to the area and need to be protected to ensure their survival. I am brand-new to blogging and actually enjoyed your blog. I am going to bookmark your blog and keep checking you out. Thanks for sharing your web site. Very interesting post, thanks for sharing! Thank you. Please subscribe to our updates and follow the excitement as we approach launch. That’s fantastic. Thanks for the feedback. Thank you. It’s a very interesting topic to write about. You’re welcome, and thanks for the feedback. It’s a topic that is very interesting to write about. Thanks for the feedback. Please continue to follow us. Thanks for the feedback on the post and the site. Please continue to follow us as we approach launch. Thanks. That would be wonderful. Interesting. Thanks for the feedback on the font size. Will check into it. Thanks as well for enjoying the blog.